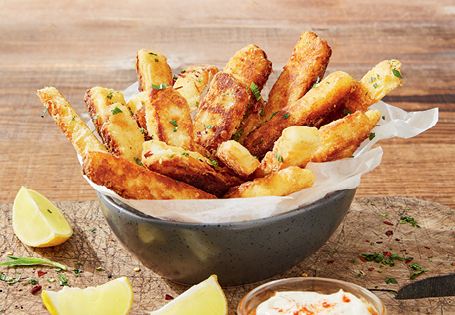 Cut halloumi lengthways into 5 slices, then cut each slice into 4 “fries”. Set aside. Mix together plain flour, cumin and paprika. Toss the halloumi fries in the flour mixture, making sure they are coated completely. Heat oil in fry pan. Fry the halloumi in batches for 2-3 minutes until golden brown and crispy. Drain on kitchen paper before serving. Best served hot. Tip: Enjoy on their own or with your favourite dipping sauce. Perfect partner to a burger!